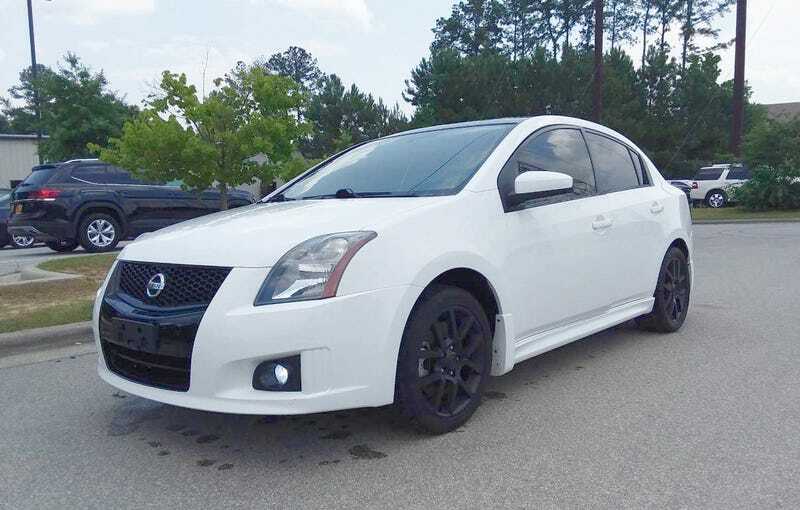 At $4,700, Might This 2007 Nissan Sentra SE-R Spec V Be a Spectacular Buy? How many ponies would you trust your car’s front wheels to handle? Today’s Nice Price or Crack Pipe Sentra sends 200 horses stampeding their way. Let’s see if this rowdy sedan’s price makes all that horsing around worth it. Last Friday I invited you to all to posit your opinion as to just exactly what makes a car a ‘classic.’ There was no definitive answer to be had, but it was agreed that, classic or not, our candidate 1984 Volkswagen GTI was not worth its $7,650 asking. At least that was the case for the 55 percent of you who dunned it with a Crack Pipe vote. Then things kind of went off the rails. Datsun’s products got increasingly uglier, the sporting Z turned into the touring-oriented ZX, and then the company adopted the corporate Nissan brand and seemed to forget that Datsun ever even happened. In the decade just past, Nissan seemed to have escaped that miasma of forgetfulness. The company hasn’t gone full Datsun yet—at least not outside of Southeast Asia—but they did start to once again offer cars that were fun. The company brought back the Z, first in 350 and then 370 form. Yes, it’s not as pure an expression of a light sports car as the original 240, but, especially in Nismo form, they are a hoot to drive. The company also has offered up a sporty sedan, although not on the mid-sized Altima or large-ish Maxima. Either of those might be an appropriate torch-bearer for the original 510, but neither gets to play. No, where Nissan put its modern day performance sedan chances, was on the scrunchier Sentra. The Sentra remains FWD throughout all its various iterations, but while earlier editions were underwhelming and coarse in their application, those like this 2007 Sentra SE-R Spec-V proved pretty well screwed down when it comes to doing its job. A lot of that is due to the tools you got when the car was properly spec’d. Let’s face facts here, like the competing Corolla, the Sentra is generally not a car that you seek out if you want to geek out. That goes for almost every Sentra from any iteration, or any model year. The notable exception is the SE-R Spec V. This one you might want. Why? Well, check out the engine. If you’re saddled with a plain Jane Sentra from this generation you get a 2-litre four that gives it up to the tune of 140 horsepower. Jump up to SE-R equipment level and that’s replaced by a 177 horse 2.5-litre DOHC QR25DE four. Now add that Spec V badge to the boot lid and suddenly you have 200 ponies. As we all know, more is better. Should you be unfortunately enough to have the standard Sentra or the SE-R—say willed one by a well-meaning but misguided aunt—then your only transmission option is a CVT. That, as we all know is like driving a moth. Again, things are different with the Spec V box checked on the order form. Do that and you get a 6-speed manual for all your gear shifting needs. An uprated suspension and 17-inch alloy wheels wrapped in aggressive meats helped make those ponies behave, and gave the ’07-’12 Spec V a level of sophistication no Sentra has the rights to exhibit. Sadly, the Sentra’s appearances couldn’t hold up their end of the bargain, and the cars look a bit awkward and chintzy. This one exacerbates that by being white, the automotive paint equivalent of a tucked in polo shirt and shorts above sandals and socks. If you can get past the color, you’ll no doubt notice that the present owner has tried to spruce things up a bit. He’s plasticoating the wheels black and smoked the tail lamps to a similar hue. No, I don’t mean he smoked them like a doobie, they are just darker because when it comes to the lights that help keep people from rear-ending you, what you really want to do is reduce their visibility. Okay, maybe not. The interior of the Spec V got some upgrades along with the row-yer-own. Bolstered cloth seats featuring Spec V embroidery fill the front of the cabin, while a similarly stitched bench takes up the back. It all looks decent in here, with just some wrinkling on the driver’s seat about which to complain. That’s to be expected after 165,000 miles, as is the need to replace some consumables. In that matter, the ad notes the refresh of both ends of the clutch hydraulics, the lower control arms in front, brake pads and rotors all the way around, and news struts front and back. We’ll have to talk to him about his avoidance of proper punctuation—who does he think he is, Cormac McCarthy? First however, we need to discuss his price, which is $4,700. Yes, that’s a lot for a decade-old Sentra. The thing is, by now you should be impressed with the fact that this isn’t your run of the mill Sentra, it is in fact the only one you might really want to buy. The question is, at $4,700, should you? For $12,990, Orange You Glad I Didn’t Say Sentra?